As previously noted in Focus on: San Bruno, Caltrain has already spent $10 million on plans to rebuild the San Bruno station with new grade separations for downtown streets. These detailed plans (refer to plan views and cross-sections) were completed several years ago, and are now dormant for lack of construction funding. The recent economic downturn is creating renewed interest in the San Bruno project, because it is technically "shovel ready" with environmental clearances, community buy-in, and preliminary design work completed. The California High Speed Rail Authority, in its drive to carve out a slice of the $8 billion of high speed rail stimulus funding, has identified the San Bruno project as one of the few "shovel ready" items it can fund before the expiration of stimulus funding in 2012. The project, estimated to cost $300 million, is likely to appear on the list to be discussed at its May board meeting. San Bruno may not know it yet, but it is definitely on the fast track. 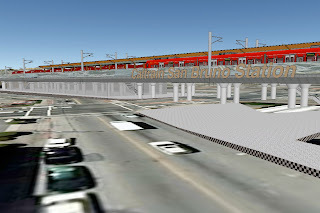 Caltrain's design for the San Bruno station was conceived for commuter rail operations, with two extra tracks added ostensibly for HSR but equally useful for Baby Bullet express service. Whatever they may claim, Caltrain's old design is not compatible with high speed rail and threatens to lock in two disastrous design decisions before the conceptual engineering for HSR is complete. First, the exceedingly sharp 60 mph curve at San Bruno would delay each HSR service by about 40 seconds; this curve was previously singled out as the worst curve for HSR on the peninsula corridor. This curve is so sharp that it needs flange greasers (shown at left) to squirt lubricant on train wheels, to mitigate wear and noise. Nevertheless, Caltrain officials have expressed ambivalence about straightening San Bruno curve, believing that the few seconds it would save are insignificant. A few seconds here, a few seconds there, and pretty soon it ain't high speed rail anymore... But why should they care, indeed? Straightening the curve for 100+ mph provides zero operational benefit to Caltrain. Any why would the CHSRA care, as they are tripping all over themselves to get something--anything--funded, and shovels turning dirt? Unfortunately, jerking a high speed train through a sharp 60 mph curve is very energy intensive and environmentally wasteful, and fundamentally at odds with modern train control software which seeks to minimize energy consumption. Assuming a realistic, environmentally appropriate, energy conservative speed profile, the San Bruno curve threatens to cost HSR far more than the 40 seconds lost in a lead-foot acceleration scenario. Second, Caltrain's new station design at San Bruno puts the platforms on the outside, with the express tracks in the center. As was discussed in Slow Traffic Keep Left, this is probably not the best arrangement for a corridor shared with HSR, mainly because Caltrain service disruptions can propagate to HSR and disrupt service state-wide. Where to put the express tracks, and thus where to place Caltrain station platforms, is one of the most fundamental design decisions to be made on the peninsula, and it should be decided by a rigorous trade study. Such a momentous, corridor-wide decision should not default to five-year-old plans drawn up outside the high speed rail project. Since a picture is worth a thousand words, a 3D model may be worth a thousand pictures. Here is the future San Bruno station and grade separation done right: with the curve straightened out for 100 mph operation, and a central island platform for Caltrain. All pedestrian access paths lead to the correct platform. High speed trains, running on the outside tracks furthest away from the platform, save at least 40 seconds by avoiding the need to slow down for the sharp curve. That doesn't sound like much, but it's nearly half a percent of the entire express run from San Francisco to Los Angeles. Savings like this are too good to pass up. A continuous viaduct can be built across both San Bruno and San Mateo avenues, resulting in easy pedestrian access from anywhere in the vicinity of the station. The changes affect only the station area and adjacent curve. 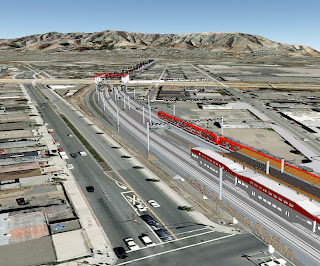 The remaining grade separations are identical to those proposed by Caltrain. To be fair, this San Bruno design does have a few drawbacks. Straightening the curve requires taking a few residential properties on Montgomery Ave. by eminent domain--politically not very savory, considering this will likely be one of the first HSR construction sites on the peninsula. Nevertheless, such takings are kept to an absolute minimum by careful design of the curve, and amount to a tiny fraction of the project's $300 million price tag. The area allocated to station parking is also reduced somewhat, although an equivalent amount of parking could be recovered on the west side of the tracks. 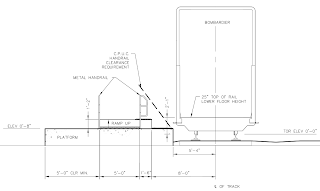 The vertical track profile is similar to Caltrain's (see Appendix B page 4). The new horizontal alignment (see dimensioned plan view PDF) features a 1200 m (3900 ft) radius curve, good for 109 mph at 12 inch total equivalent cant or 100 mph at 10 inches. The 210 m (700 ft) long by 9 m (30 ft) wide platform is very slightly tapered to minimize the area consumed by track slews at each end of the platform; the radius of the southbound platform face is 6000 m (20,000 ft) and produces a less than 1 cm (3/8 inch) ADA-friendly platform gap, with a benign, ADA-friendly 25 mm (1 inch) superelevation, as demonstrated by the Bombardier cars placed in the 3D model. It is likely that all four tracks can fit under the I-380 viaduct without moving any support columns. Even if this were not feasible, and supposing that it became necessary to relocate one row of six columns, the CHSRA has already demonstrated a willingness to move freeway supports in their design for the north end of Tunnel #2 under I-280 in San Francisco. If it makes sense there, it makes far more sense in San Bruno. In recognition of the tight clearances under I-380, accurate Bloss spiral transition curves are shown. The tracks and station foundations do not interfere with existing BART tunnel, and the curve is configured so as to fit between the I-380 support columns while minimizing excursions from the existing right of way boundaries. These improvements are likely feasible without major re-engineering of adjacent civil structures. On the whole, this proposed configuration would be a highly effective update of Caltrain's plans for San Bruno, making them fully compatible with High Speed Rail. Can we hope San Bruno will be done right? Many thanks to Richard Mlynarik for his 3D modeling skills and advice on track geometry. Preliminary design for the California High Speed Rail project is proceeding in the absence of key regulations from the California Public Utilities Commission (CPUC), the Federal Transit Administration (FTA), the Federal Railroad Administration (FRA), and numerous other agencies. While high speed rail is a very mature technology, it is still foreign and exotic in the United States, and our regulatory agencies do not yet have an effective or complete regulatory framework in place to direct the development of high speed track and trains. The regulatory vacuum is already causing some strange and potentially regrettable design decisions to be made, with negative consequences for the peninsula corridor. The side clearance dimensions around passenger rail platforms in California are regulated by the CPUC under General Order No. 26, originally issued in 1948, covering every relevant railroad situation from stock chutes to icing refrigerator cars. Where freight trains share tracks with passenger trains, as they do on the peninsula corridor, G.O. 26 limits passenger platforms to a height no more than 8 inches (203 mm) above the top of the rails (ATOR) to allow trainmen to ride on the side of freight cars without fear of getting clipped. Of course, none of these olde-tyme railroad practices are very relevant to 21st century rail technology. Nevertheless, 8 inches is the maximum height of all existing Caltrain platforms. Taller platforms are allowed, but only beyond 7 feet 6 inches (2.3 m) from the track center line; in other words, taller platforms are only allowed if they do not come closer than about 3 feet from the side of a train. A lot of good that does for passengers! Combine G.O. 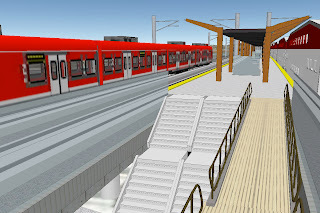 26 with ADA accessibility requirements, and you get a ghastly regulatory abortion called a "mini high platform" (see figure at right), to facilitate wheel chair boarding using a so-called "bridge plate" manually placed across the yawning moat between the high platform and the train. Mini-high platforms continue to sprout up and down the Caltrain line, most recently in Redwood City and Menlo Park, while elsewhere in the world, humans have discovered level boarding. Of course, the regulatory rigors of accommodating freight trains are not anywhere on the CHSRA's radar screen, which is why they are planning for level boarding platforms regardless of where Caltrain eventually ends up--one can only hope, higher than eight inches. At stations to be served by both HSR and Caltrain, namely San Francisco, Millbrae, Redwood City or Palo Alto, and San Jose, it is quite possible that we will end up with different, incompatible platform heights with station tracks forever assigned to one or the other type of train. This runs counter to the most basic principles of interoperation, where the flexibility to assign any train to any platform (in a pinch) is paramount. Moving beyond MOUs, who will bring about amended regulations to ensure that we have a common platform standard for HSR and Caltrain? Who will make sure this standard allows the off-the-shelf procurement of new trains, without costly redesign? A hint: the most relevant platform heights are 22 inches (550 mm) and 30 inches (760 mm). Why is Caltrain apparently not vigorously pursuing a waiver of G.O. 26? Like platform clearances, overhead electrification of railroads is regulated by the CPUC. General Order 95 specifies the rules governing overhead electric line construction in California. Garden-variety 25 kilovolt overhead electrified railways do not exist in California, and G.O. 95 therefore does not allow them. That's right: 25 kV electrification is currently illegal in California. Caltrain has long-standing plans to electrify the peninsula corridor, and had been pursuing new regulations with the CPUC to cover 25 kV trains. More recently, the approach appears to have shifted towards obtaining a waiver from G.O. 95 instead. Whatever happens, why is the heavy lifting for high speed rail being left to Caltrain? Moving beyond MOUs, where is the coordinated approach with HSR? Railroad safety in the United States is regulated by the FRA in a manner that places a premium on crash survival over crash avoidance. That's why we still have the 19th-century practice of train engineers calling signal aspects to their conductor (unless texting on their cell phone), with few if any automated systems to catch human errors. This safety philosophy is well-suited to the cost structure of the heavy freight rail business that dominates our landscape. On the opposite end of the spectrum, high speed rail safety relies almost entirely on avoiding a crash in the first place--not unlike airliners. In Europe, high speed trains zoom through dense fog at nearly 200 mph, with a train control computer watching over the driver's every move. Both philosophies achieve the intended level of safety, but what is supposed to happen when you need to mix both types of traffic on the same corridor, as is planned on the peninsula? To their great credit, Caltrain is taking the national lead on the issue of mixed traffic regulations, as part of their plan to operate European-style passenger trains that are considered "non-compliant" with existing FRA safety regulations. As of September 2008, Caltrain staff estimated the likelihood of obtaining regulatory relief to be closing on 90 percent. That's very encouraging. Why is Caltrain specifying CBOSS as a wireless system, excluding an entire segment of the wired train control market? Is CBOSS an expensive re-invention of the wheel, where existing train control systems such as the Japanese Digital ATC and the European ETCS Level II might plug-and-play? Why is Caltrain moving ahead with a solicitation this year, fueled by $500k in federal funds earmarked by congresswomen Jackie Speier and Anna Eshoo, for implementation in the next couple of years--before HSR train control requirements are fully defined? Why should Caltrain be taking the lead on this critical technology issue, when the standard they develop will need to be applied California-wide to the entire HSR system and likely other HSR corridor traffic such as Metrolink, Union Pacific and BNSF? Sometimes, doing it right means stopping and charting a new course. One of the fundamental principles of good systems engineering is that you must develop a complete and concise set of design requirements before you dive into the detailed design of station platforms, overhead electrification or complex train control systems. Caltrain does not seem to have fully absorbed the extent to which HSR alters the requirements of nearly every improvement project in their pipeline. Preliminary design activity on all the above items should be slowed and resources re-allocated towards bringing the technical requirements and regulatory framework into better focus. The successful integration of HSR and Caltrain on the peninsula corridor depends on it! There's a lot of talk among peninsula communities about the virtues of tunneling certain portions of the peninsula rail corridor that run through residential neighborhoods, in order to mitigate the potential above-ground impacts of increased traffic, faster speeds, noise, vibration, visual blight of overhead electrification and grade separations, etc. Tunnel advocates evoke visions of tunnel boring machines silently toiling underground, leaving the land above all but untouched. These visions need to be tempered with some basic facts about tunnel engineering. A four-track tunnel is too wide (~80 ft) to be excavated using a tunnel boring machine. At a minimum, two tunnel bores would be required, driving up tunnel costs. Boring a tunnel in soft soil under the water table is difficult because hydrostatic pressure increases with depth, making the tunnel more vulnerable to leaks and flooding. Boring a tunnel in soft soil often causes subsidence. While this settling of the soil can be predicted and mitigated to some extent, the foundation of a house can be severely damaged by very small strains, curvatures or tilts of the underlying soil. Once it is decided to build a tunnel, the method of construction is up to engineers and accountants. 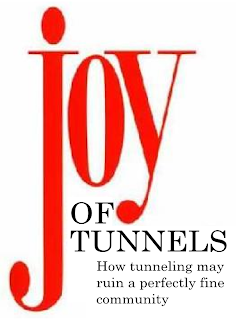 In peninsula communities where a shallow tunnel would suffice to mitigate noise, vibration and visual impacts, it is unlikely that they would select a bored tunnel, using massive tunnel boring machines. A far more likely approach is a cheaper cut-and-cover tunnel, where a trench is excavated and a roof built over it. For reasons of fire safety, and possibly to accommodate the occasional diesel train, long tunnels must have extensive forced ventilation systems with large head houses constructed above ground. These structures contain powerful fans that are anything but quiet. In a fire, a tunnel becomes an oven filled with toxic smoke. A four-track tunnel would have to be divided into at least two separate hermetically sealed sections to allow for emergency evacuation of hundreds of passengers. These fire-proof partitions add width to the tunnel. Tunnel evacuation walkways need to be provided, adding some width to the tunnel. These walkways need frequent access to the surface along the length of the tunnel, for passenger evacuation as well as emergency access. Running trains at 125 mph in a tunnel requires ample aerodynamic clearances to prevent strong pressure waves from forming between trains and tunnel walls. Pressure waves can cause intense discomfort (ear popping) and may even threaten the stability of a train on the tracks. For 125 mph operation, a typical clearance is 12 to 15 feet between the track center line and tunnel wall. Digging a cut-and-cover tunnel while Caltrain continues to operate will probably require temporary shoofly tracks around the construction site. These tracks occupy about 30 feet of right of way, in addition to the width of the tunnel construction site. 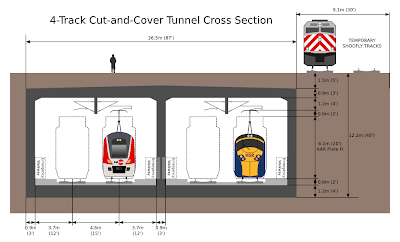 Cut-and-cover tunnels of the size required for Caltrain and HSR will have concrete walls about 3 feet thick, to give them the structural integrity and seismic stability that the surrounding soils lack. The overall width of a four-track cut-and-cover tunnel structure (accounting for 3-foot wall thickness, 15-foot track spacing, 12-foot side clearances for aerodynamics and evacuation, and two separate tunnel sections separated by a central wall) comes to 87 feet. The overall depth of a cut-and-cover tunnel structure (accounting for 4-foot base slab, 2-foot trackbed depth, 20 feet of vehicle loading gauge, 6 feet of overhead contact system high voltage clearances, a 3-foot roof slab and a 5-foot soil layer) comes to 40 feet. The soil cover might be thinner or thicker than 5 feet according to local topography; 5 feet is a realistic average. Building a 40-foot deep, water-tight barrier in an area with a high water table, extensive underground aquifers and surface creeks running perpendicular to the railroad is likely to cause changes in the water table, possibly leading to localized subsidence or flooding. Continuous pumping of surrounding aquifers may be required to prevent hydrostatic pressure buildup and excessive flotation (and cracking) of the sealed tunnel structure. The amount of excavation for a four-track cut-and-cover tunnel is about 700,000 cubic yards per mile (330,000 cubic meters per km). A five-mile tunnel would require the removal of enough dirt to equal the volume of the Great Pyramid of Giza. Including shoofly tracks and additional construction easements required to build the vertical walls, the overall right of way consumed by a cut-and-cover construction site could easily exceed 120 feet. Some of the dirt excavated for tunnels may be contaminated by underground toxic plumes containing chemicals known to the state of California to cause cancer and birth defects or other reproductive harm. Such dirt would have to be treated and disposed of according to state and federal environmental regulations. The primary criticism of tunnels has been cost, which can be roughly extrapolated from other Bay Area tunnel projects currently being planned. The BART extension to San Jose includes a five-mile, two-track, three-station tunnel for $3 billion ($9,500 per inch). The Caltrain extension to San Francisco's Transbay Terminal includes a 1.8-mile, three-track, two-station tunnel for $2.1 billion ($18,000 per inch). Based on these estimates, we can reasonably expect construction costs to be on the order of $10,000 per inch, give or take a factor of two. Of course, tunneling conditions will vary according to each specific location. The California High Speed Rail Authority's consultants and geotechnical experts will certainly do a more detailed job of evaluating feasible tunneling options, as their project-level environmental impact process gets underway. In the meantime, this layman's overview is intended to put tunneling back in perspective among the other configuration options for portions of the peninsula corridor. Much of the controversy surrounding high speed rail on the peninsula arises from a concern that HSR may form a disruptive barrier that physically and visually separates neighborhoods on each side of the tracks and undermines the urban design goals of the communities along the corridor. 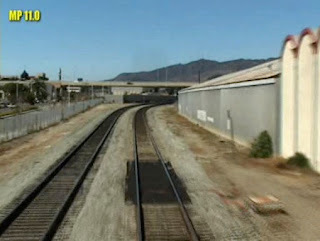 (Photo at left: a Caltrain embankment in Belmont.) This impact is often described by drawing an emotionally potent analogy to the Berlin Wall. The flaw in this analogy is that it assumes that a barrier must be both visual and physical. Semantics? Not really: visual and physical barriers are not necessarily the same thing. This distinction is very important to the high speed rail debate, and is totally lost in the Berlin Wall analogy, intentionally or not. A barrier can be physically strong--preventing pedestrian, bike or auto access across the tracks, and negating the ideals of a walkable, bikeable community. And yet, that same barrier can be visually weak. 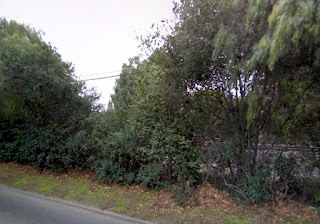 The Caltrain tracks through Palo Alto (street view at right) are an excellent example of a strong physical but weak visual barrier. In a span of four miles, there are just nine places where pedestrians may cross. There are even fewer crossings for cars. And yet, the tracks are visually unobtrusive and concealed by vegetation. In many locations along the Caltrain corridor, an invisible "wall" already exists today, so deeply ingrained into daily circulation patterns that few ever notice it. That's no wonder: it's been there since before any of us were born. 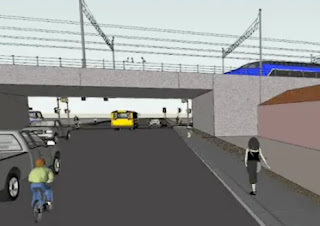 Some new grade separations envisioned for high speed rail, depending on how they are built, may create new visual barriers. The strong visual impact of raising the tracks, with the addition of 30-40 feet of overhead electrification wiring, understandably has some neighbors worried. However, physical access would be preserved and even improved because trains would no longer interrupt pedestrian, bike or road traffic flows, as they currently do about 100 times a day. Given that physical access would be maintained (and possibly improved) by HSR, the analogy to the Berlin Wall falls apart. While the Wall's primary function was to deny physical access, the function of a grade separation is to allow physical access across the tracks. A local, real-world example of a strong visual but weak physical barrier is found in Belmont. The retained embankment is ugly and intrusive, as shown in the opening photo of this post, but it has several crossings through it--for example, as shown in the photo at right, taken from just a few feet away. 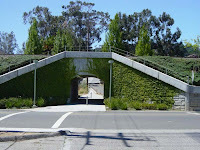 The Belmont Caltrain station, at El Camino and Ralston, has a very pedestrian and bike-friendly design with direct access across the tracks. Access across the railroad tracks can be optimized for different users, and the best grade separation design really depends on whose needs are prioritized first: bicycles and pedestrians, cars and trucks, or the train. No design will be perfect for all three. Many communities that have grown and gradually saturated their historical main arteries are now making an effort to relieve auto traffic by improving access and circulation for bikes and pedestrians. What are the features of a grade separation that promotes a walkable and bikeable community? Minimal grade change. That's not just a matter of convenience; the ADA requires extensive ramps or elevators where significant grade changes occur. Elevators in particular create maintenance and sanitation problems. While such features are sometimes necessary, they are generally expensive (also profitable to build!) and are neither pleasant nor quick to navigate. It is best to avoid this problem altogether, by keeping pedestrian / bike / wheelchair access as close as possible to grade level. Direct and short. The design of the access paths to a crossing should avoid forcing bike / pedestrian traffic onto circuitous detours from their intended path. If the point is to get across the tracks, let people get across the tracks quickly. Long access paths remove freedom of movement and make the user feel constrained and unsafe because of how long it takes to get across. Open sight lines. Tunnels and ramps that twist and turn without providing a clear line of sight to the other side do not convey to their users a sense of safety and destination. No amount of lighting, fancy landscaping or architectural detail can compensate this problem. The best option is, of course, a train tunnel that makes the problem disappear and entirely removes all physical and visual barriers, including what barriers may exist today. As long as they don't have to pay for it, anybody would logically support this option... but given that tunnels are likely to be prohibitively expensive, what is the next most reasonable option?